Here I am at the far left saying something brilliant and witty. Tereasa Payne, Shelley Collins, David Weiss, and Jim Walker look on in wonder and delight. 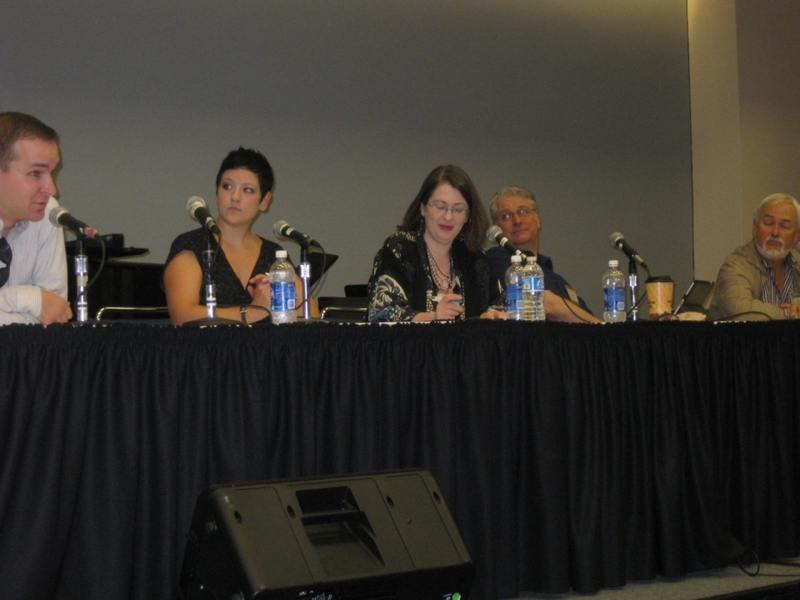 At this year’s NFA conference, I had the very cool opportunity to be part of a discussion panel about woodwind doubling. The panel was organized by Florida flutist and doubler Tereasa Payne, and moderated by my Delta State colleague Shelley Collins. The panel consisted of me, Tereasa, Hollywood studio great Jim Walker, and David Weiss, who is the ethnic flutes soloist for Broadway’s The Lion King. It was an honor to be included in a group of such stature! We spoke to a surprisingly large and enthusiastic crowd. At one point Shelley asked for a show of hands by the doublers in the audience, and we were blown away by all the hands that shot up. The audience asked great questions, and many stayed afterward to talk some more. I was delighted to meet several of you personally who read this blog or who have communicated with me by email or on Twitter.